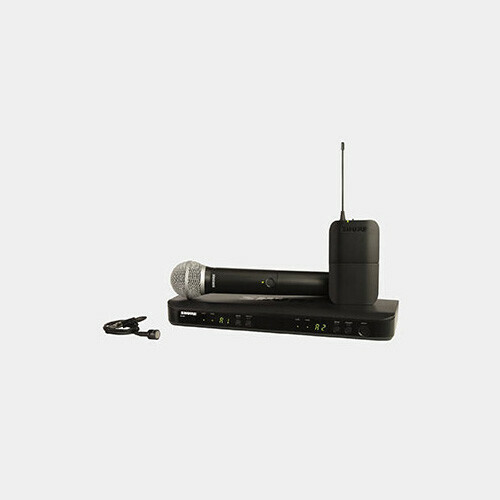 The BLX1288 Dual-Channel Combo Wireless System with Lavalier Mic and PG58 Handheld Mic from Shure includes a BLX88 dual-channel wireless receiver, a BLX1 bodypack transmitter, a PG185 lavalier mic, a BLX2 handheld transmitter with a PG58 microphone, and 4 AA batteries. The system is set to Shure's H8 frequency band and operates between 518 to 542 MHz. The PG185 lavalier mic includes a clothing clip as well as an acoustic windscreen to minimize wind noise. The PG58 features an on/off switch on the mic body and is tuned for vocal applications.